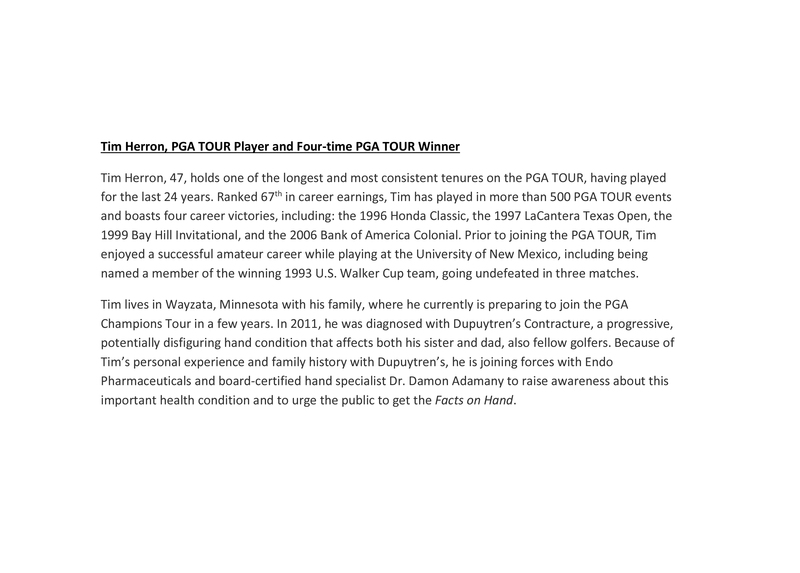 DUBLIN and MALVERN, Pa., Sept. 26, 2017 /PRNewswire/ -- Four-time PGA TOUR winner Tim Herron is teaming up with Endo Pharmaceuticals Inc., a subsidiary of Endo International plc (NASDAQ: ENDP), Damon Adamany, MD, of The CORE Institute and the Facts on Hand campaign to educate adults about one of the more common hand conditions. The campaign is raising awareness of Dupuytren's Contracture, a progressive, potentially disfiguring hand condition affecting a layer of tissue underneath the palms that can cause one or more fingers to move into a bent position so they cannot be straightened. Dupuytren's Contracture, sometimes referred to as "Viking Disease," can make everyday tasks difficult, such as grabbing an object at home, or in Tim Herron's case, a nine iron from his golf bag. Many people live with the disease without being diagnosed because they mistakenly assume they have arthritis or another hand condition. And because Dupuytren's Contracture may progress slowly, people may not pay attention to it until they can no longer straighten their fingers, complicating everyday activities. "As a PGA TOUR player for the last 24 years, I rely on my hands to make a living," said Herron. "After all, one of the fundamentals of a great swing is a proper grip. What my fans may not know about me is that I am living with Dupuytren's Contracture, a condition that could literally be a game-changer for my golf game. I'm lucky that it hasn't progressed to the point where it has affected my sport, but I've seen firsthand how it can advance in the people I love." Both Tim's father and sister, fellow golfers, also have the condition, which tends to run in families, especially those with Northern European descent. That's why raising awareness of Dupuytren's Contracture is important to Tim. Together with Endo and Dr. Adamany, a board-certified hand specialist, Tim is encouraging those who are concerned to get educated and speak to a hand specialist or hand surgeon who can provide an accurate diagnosis and discuss possible treatment, including non-surgical options. "While symptoms usually appear later in life, over the age of 40, the condition can occur in people as young as their early 20s," explained Dr. Adamany, MD, board-certified specialist in hand and upper extremity surgery at The CORE Institute. "Men are also more often affected than women, though each patient is different. As a physician, I've seen how important getting a proper diagnosis and appropriate treatment are for a patient. Starting the conversation now and getting the facts on hand is the first step in getting educated about Dupuytren's Contracture." "Bringing forward educational programs like Facts on Hand is part of Endo's long-standing commitment to addressing health issues," said Patrick Barry, Senior Vice President, U.S. Branded Pharmaceuticals at Endo. "We hope that through this initiative, more individuals with signs of Dupuytren's Contracture will seek help." "We all rely on our hands to a certain extent," said Herron. "That is why I'm urging everyone who thinks they or their loved one might have Dupuytren's Contracture to make an appointment to see a hand specialist or hand surgeon who can provide a proper diagnosis and discuss possible treatment options." Endo Pharmaceuticals Inc., headquartered in Malvern, PA, develops and markets high-value, quality branded pharmaceutical products for patients in need. 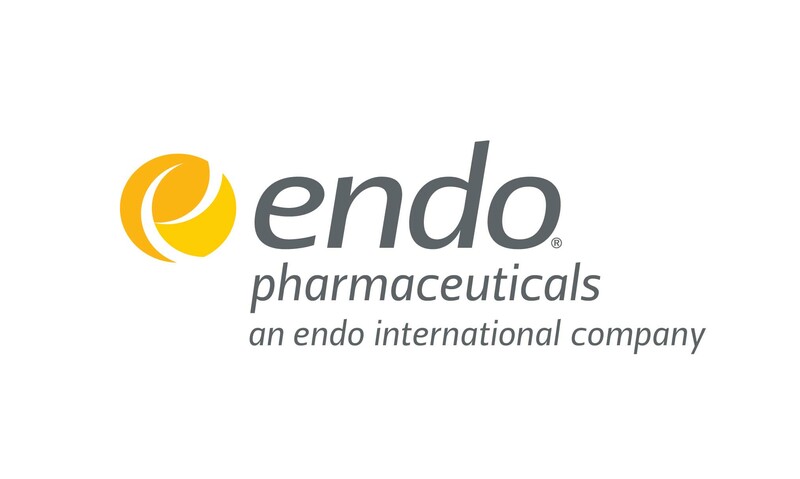 Endo Pharmaceuticals' portfolio includes products for urology, men's health, orthopedics, endocrinology and hematology. Endo Pharmaceuticals is an operating company of Endo International plc. Learn more at www.endo.com or www.endopharma.com.